HONG KONG, China (CNN) -- Tens of thousands of people converged Thursday on a park to mark the 20th anniversary of the bloody crackdown on pro-democracy protesters in Tiananmen Square. A man holds up a candle in honor of the Tiananmen victims at the Hong Kong candlelight vigil. Organizers estimated that 150,000 people attended the candlelight vigil, while Hong Kong police put the number lower, saying there were 63,000. The gathering, which marks the sole commemoration on Chinese soil of the protest, was organized by the Hong Kong Alliance. The candlelight vigil was held as authorities in mainland China stepped up controls on media and Internet news and social networking sites. Hong Kong is known for having a tolerant attitude to protests, and the vigil has been held in the southern Chinese enclave's Victoria Park for years. 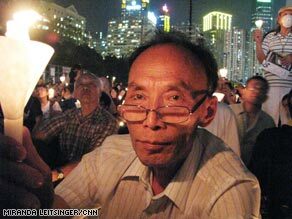 Thomas Yau, a 75-year-old originally from Beijing, said this was the first time he had been to a vigil honoring lives lost in Tiananmen Square, despite moving to Hong Kong 30 years ago. Asked why he was attending Yau told CNN: "To feel the whole atmosphere, to feel what it's like in Hong Kong about this whole Tiananmen incident and tell my friends who have spent their whole lives in China that actually we can do it and spread the idea that we should fight for democracy." The Hong Kong Alliance, which put on the vigil, also held a march in the city over the weekend that included a former Tiananmen student leader making his first trip back to China after fleeing 17 years ago. "It's just like a copy of 1989 Tiananmen Square demonstration. It's not only a copy, it's more, more than that ... It reminded me of everything 20 years ago," Xiong Yan, now a U.S. Army chaplain in Alabama, said of the hours-long march last Saturday. "If we take action, we can make change, we can do something. ... We have power right now, I mean peaceful power." Xiong Yan's presence was the first time a former Tiananmen student leader was able to come to Hong Kong to address a crowd, said Lee Cheuk Yan, vice chairman of the Hong Kong Alliance. Authorities in China are "almost systematically eliminating the memory of June 4th itself," he said. "So by coming out, our generation as a witness is trying to tell our next generation it's important to pass the torch onward -- that China has not yet democratized and not yet vindicated June 4th. So, we need to struggle onward for democracy." Yau King Chi, a 19-year-old university student of social work in Hong Kong, went with about 10 classmates to Victoria Park. They held handwritten signs calling for democracy in China and better education about the Tiananmen chapter in Hong Kong schools. "The Chinese government still has not recognized that they have done the killing in June 4, 1989, so we hope that through this candlelight (vigil) we can urge the government to say that they have actually done this massacre and take up the responsibility," he said. The organizers were aiming for a crowd of 100,000, many from mainland China. At the 15th anniversary commemoration, 82,000 people had turned out. A little more than 20 years ago, students gathered in Tiananmen Square to memorialize the recently-deceased Hu Yaobang. He was fired as Communist Party chief in 1987 by Deng Xiaoping for pushing policies deemed too soft toward "bourgeois-liberal ideas" and tolerating student protests. The April 15 memorial quickly turned into a pro-democracy movement, and students held talks with the government and later a hunger strike in Tiananmen Square to press their cause. On June 4, Chinese troops in armored personnel carriers and tanks rumbled toward Tiananmen Square. * Survey of 1,011 locals conducted by the University of Hong Kong Public Opinion Program. The soldiers, on strict orders to clear the square of demonstrators, had forced their way through the city's main thoroughfare. Along the way, they met fierce resistance from students and city residents who barricaded the streets, so they fired at them. When the firing stopped, hundreds if not thousands of people lay maimed or dead. Relatives of victims renew their hopes every year that Beijing's leaders will reverse the verdict that the protests were a counter-revolutionary rebellion that had to be put down. "My son was innocent, he committed no crime, he didn't steal, he didn't kill anyone, he was just a child," said He Fengting, whose son Liang died during the 1989 protests. "How can they be so cruel?" A University of Hong Kong survey found that more than 60 percent of Hong Kong residents support a revision of the official stance on the Tiananmen uprising. But a change does not seem likely since that would require a political consensus. Conservatives would view such a move as undermining the party's legitimacy and tarnishing the legacy of Deng Xiaoping. Others, like Xiong Yan, hope that one day China will move to democracy. "We hope China have a big change, peacefully, and that the point is, that we hope in China people can enjoy freedom," he said. CNN's Jaime FlorCruz in Beijing contributed to this report.